The following article has been made possible by a sponsorship from Marketo. 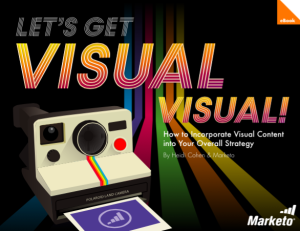 Download the special ebook “How To Incorporate Visual Content” here. Digital marketers have the motive, means and opportunity to use sophisticated attribution modeling. So why aren’t more of us doing it? Let’s not talk about best practices for using attribution models to measure the effectiveness of your digital marketing campaigns. Type “attribution modeling” into your search bar and you will have a windfall of insight and guidance on the subject from some of the best marketing brains in the world. And let’s not spend our time here debating the merits of various attribution scoring techniques. Because research tells us only about half the companies in Europe and North America do any sort of marketing attribution analysis in any case. No, let’s stick to basics and ask a frank question: If you can count your company among those using attribution models with your digital campaigns, are you still defaulting to traditional “last-click” measurement? It’s OK to admit it, because it’s understandable. Not long ago, we had little choice but to rely on the last click. 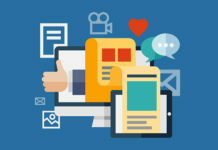 We had the motive: demonstrate marketing’s ability to drive revenue. But we didn’t have the means. The data connecting each touch point along a customer’s path to purchase wasn’t available or reliable. Moreover, the tools for analyzing this type of information were neither sophisticated nor affordable. Spending most of your marketing budget to determine whether or not marketing was working just didn’t add up. Plus, we rarely had the opportunity to analyze. Who had time in the past, and has time now, for hours of complex modeling? All modern business moves as fast as the latest microprocessors can carry it, which lays heavy pressure on us marketers to produce results just as quickly. Digital marketing is not just about driving revenue; it’s about driving revenue ASAP. So, if the last marketing tactic in a campaign produced a sale, we gave it 100% of the credit – even though we all knew a mix of campaigns and as many as five touch points preceded that sale. On some level, we also knew we were sacrificing the potential modeling would deliver. We knew we could beat our competitors, if we could just see the whole picture. We knew we could produce more revenue, if we could focus time and effort on the most successful campaigns. And we knew we could cut costs without sacrificing our returns, if we could determine the optimal balance of spending between branding and direct-response. But for that edge on the competition, that boost in productivity and that increase in ROI, we would have needed to understand the intricate relationships between campaigns, precisely how one influenced the other. And finding out was complicated and expensive. 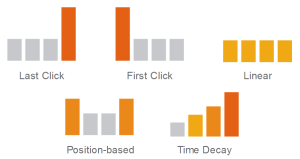 Last-click analysis was quick and easy. So it became our crutch for showing digital marketing works. Well, we can drop that last-click crutch, because today we have the motive, means and opportunity to use sophisticated attribution modeling. Our motive should be stronger than ever. 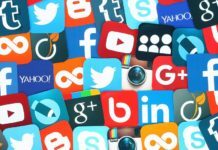 A flood of handheld devices and epidemic of mobile applications is giving us digital marketers more ways to reach more customers more often than ever before. And at the same time, technology is facilitating unparalleled access to consumers and businesses, technology is enabling unprecedented means of measuring the impact of our outreach. In this era of Big Data, unavailable or unreliable streams of data swiftly are fading in the rearview mirror as users speed through billions of transactions every day. Meanwhile, software tools for capturing and measuring that information are multiplying and improving rapidly. Researchers estimate nine out of every 10 websites has some sort of analytics package attached. And recently, our opportunities to analyze have expanded. Major players in the field of web analytics have been making strategic moves to deliver robust attribution modeling capabilities. In the last year Adobe, Google and IBM all unveiled refinements to their analytics engines that sharpen attribution modeling tools. So, why aren’t more of us using sophisticated attribution modeling? Maybe we’ve been leaning on the last-click crutch for too long. Maybe we need some therapy to learn to walk this path of analysis on our own. 1) Find It – If you have a web analytics package, odds are high that attribution modeling tools are in there somewhere. If you can’t find the module, search for help online or just ask your software provider. Turning on modeling capabilities may come with a price tag, but the move also comes with potential rewards, such as aforementioned competitive advantages, elevated productivity and greater ROI. 2) Learn How to Use It – Plethora is the proper word to describe the amount of online information available regarding attribution modeling. As noted earlier, within a few quick searches you’ll be learning from the best minds in marketing. The plentitude may be intimidating at first, but these days digital marketing is not for the timid. A little unease is understandable; long-term ignorance is not. 3) Build It into Your Routine – We all have marketing goals. We all have plans for achieving those goals. Include attribution modeling in those plans from the start, in mid-stream or even in retrospect. The data is there. The tools work. You must measure your results in some way. Start using the most powerful method as soon as possible. At today’s breakneck pace of business, every delay in analysis could lead to lost sales, drops in productivity and/or dips in ROI. As experienced marketers, we all know driving revenue requires investment – in terms of time, budget and mindshare. Sure, walking without that last-click crutch may be uncomfortable at first. But with some discipline and dedication, you’ll be running in no time. Kurt Anagnostopoulos is co-founder of KeywordFirst, a digital marketing firm, and has held executive positions in internet marketing and e-commerce for W.W. Grainger and SMG Search, a division of Starcom MediaVest Group. Reach at him at Kurt@KeywordFirst.com.